Whenever I’m on one of my road trips I find that it’s very important to check out the surrounding cities to your destination. There’s always great gems to be found. S’macks Burgers & Shakes is in Sarasota which happened to be on my path toward a weekend I was spending in the Tampa Bay area. I’ve also been following them on Instagram and checking out the Burgers they’ve been making. They caught my eye & were already on my radar, what can I tell you. First time here which meant I was going the Original route with only Cheese and S’macks Sauce. Now, before I got to that I also had to sample the Double Cheese Cheese Dog…..yes double. Two Dogs split and grilled on the flattop topped with Chili, Cheese Sauce, and Diced Onions. Look I’m embarrassed to admit this but you know I don’t keep anything from you guys, I knife and forked it. I had to, there was no possible way to eat it without making a giant mess all over my shirt. It was messy good but I’ll stick to a single more manageable Dog next time. The Garlic Herb Parmesan and Beer-Battered Onion Rings were both winners. I should put an asterisk next to the Fries as they were probably the most addictive of all the things I tried at S’macks Burgers & Shakes. As Grilled Cheeses go, the one I had with Cheddar Cheese, Blue Cheese and Bacon was right on point. If you’re a Blue Cheese kinda person then this is the sammy for you. You’ve gotta keep it simple on your first time somewhere. I know folks who try these crazy toppings then hate on a place. I like to go the basic route and work my way up to some insanity. The Original Double was a perfect little ditty. 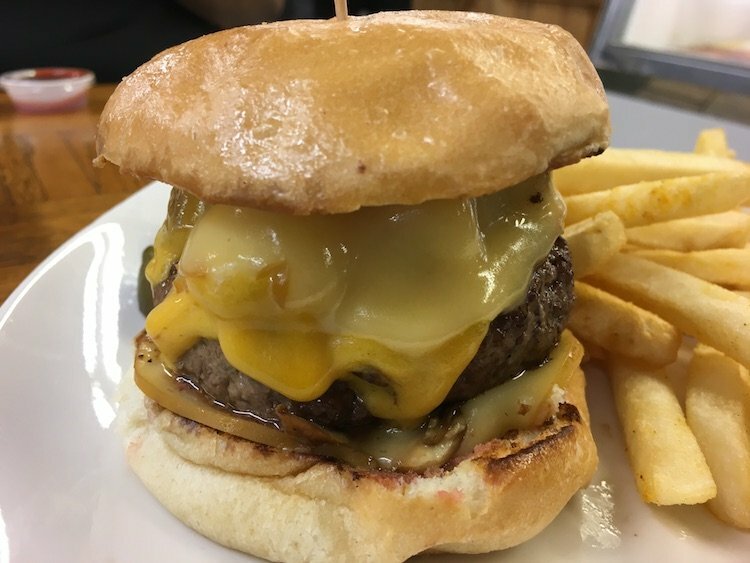 The S’macks Sauce is not overpowering and adds the right condiment element to the nice griddled Burger Patties with melted American Cheese. This is a can’t miss Burger. The special Frozen Custard was Chocolate Orange. The best way to describe it is if Orange Julius had a Chocolate version then this would be it. If you don’t understand what that means think Slushy Orange meets Chocolate flavor. I can at last use an adjective that I’d never think to with Chocolate…..refreshing. S’macks Burgers in Sarasota is a great spot and made for a perfect little break on our way to Tampa. Next time it will be our destination.